You know how I know you can’t take jam with you in your carry-on luggage? Guess. 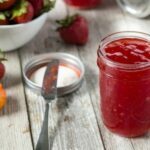 I was coming back from Seattle a few years back with an incredibly divine strawberry habanero jam from Pike Place Market safely packed away when it was quickly confiscated from me at the security check point. I swear I heard the sound of the jar popping opening as soon as I was out of sight from the security agents. They totally ate my jam. So when Asheley and I picked a small arsenal of strawberries a few weeks back from the local organic farm, I knew immediately what I was going to make. It was time to reverse the nightmares brought on from that horrific jam-conspiracy from long ago. Full disclosure. I’ve never made jam before, and was super nervous that something was going to go wrong. The interruption of a roof salesman knocking at the door during the process didn’t help. But you know what, making jam is all bark and no bite. Well actually, this jam does have a bite. But a pleasant one. You get all strawberry first, then you actually taste the flavor of the habanero pepper, but then at the very tail end, at the very last moment, just a little bit of heat warms up the back of your mouth. Just a note: I don’t have a canning pot and rack like described in the above links, so in the canning class I took last summer, the instructor said you could use any large stockpot and line the base of the pot with a couple dish towels. The towels will float in the water, but when you place the jars on them, they will sink down and it will help keep the jars from shaking around in the pot. Another note: this recipe calls for liquid fruit pectin. There is also powdered fruit pectin. They are not interchangeable, as the process to activate the powdered variety is different than the liquid one. *make sure to measure out the strawberries crushed. It will probably take between 3 to 4 pints of whole strawberries. **make sure to wear plastic gloves when mincing the habaneros. I usually just make a makeshift plastic “mitten” with a plastic bag. Using a potato masher or your hands, crush the strawberries in a large bowl, leaving some bits of the fruit for a good textured jam. Measure out 4 cups of crushed strawberries into a pot. Stir sugar into fruit, along with the habanero, lemon juice, and apple cider vinegar. **I know 7 cups of sugar is a lot, but it is necessary for the jam to set properly. Over high heat, bring mixture to a full rolling boil, which is a boil that doesn’t stop boiling when stirred. Stir in pectin quickly and return to a full rolling boil for exactly 1 minute, stirring constantly. Remove from heat and spoon off any foam with a metal spoon. Ladle jam into jars (a funnel helps this process) and let cool. Once cooled, keep refrigerated. Jam will keep for a few weeks refrigerated. you know they totally ate your jam after confiscating some crackers from the next guy…haha! 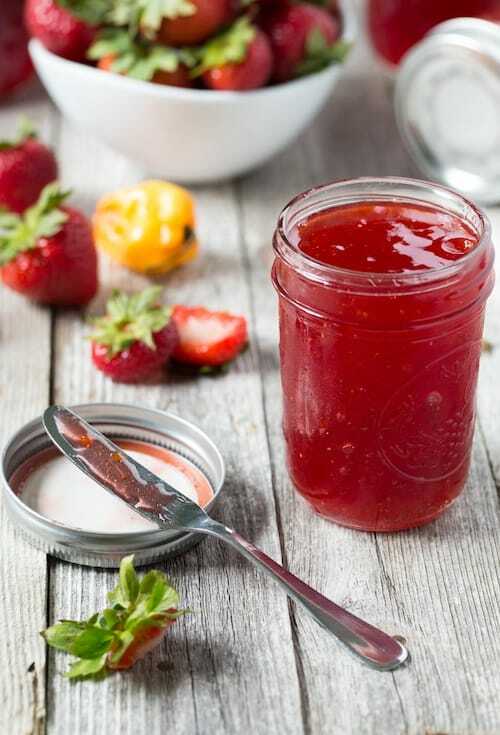 I think it is so awesome that you made jam…especially with habaneros in it 🙂 I might have to try making this since I have several pounds of strawberries still in my freezer. As scary as the habanero sounds I bet it tastes great. Just a few days ago I made a Mango Chili Butter and I like the hint of heat that lingers after you taste it. Hope you have a fun weekend, Chris!!! Totally did Sandra… they totally did. They must know what food products are really good throughout Seattle, and wait for those items to pass through their checkpoint! Don’t be scared by the habanero! Embrace it. Love it. Be one with the habanero. Mango Chili Butter sounds great!! Ah this sounds incredible! I love a little heat with my sweet! I am going to have to brave jam-making some day as well, and this seems like an amazing way to start. I was just wondering about how much this recipe produces? My first time to make jam. Went great by the way. But I have to say as a Texas Lady if your looking for heat I would at lest double the amount of habaneros. But other than it was fantastic. Can’t wait to get all mad scientist on this jam stuff. What goes best with this amazing jam. You can make a pretty sophisticated PB&J with a little sea salt, or make simple crostini with a little creamy cheese! Would you say the finished jam has some heat to it? Would it be good used as a glaze on chicken or pork or for dipping with pretzels? Yes, it definitely has some heat, but just in the back of your throat. It’s not overbearing in my opinion, but I do have a little bit of threshold when it comes to heat. Hmmm, I think using it as a glaze for pork sounds FANTASTIC! Ooo dipping pretzels sounds great also! I like to use it with a little bit of a creamy type soft cheese on crackers for a quick and easy app. I am super excited to make this tomorrow. 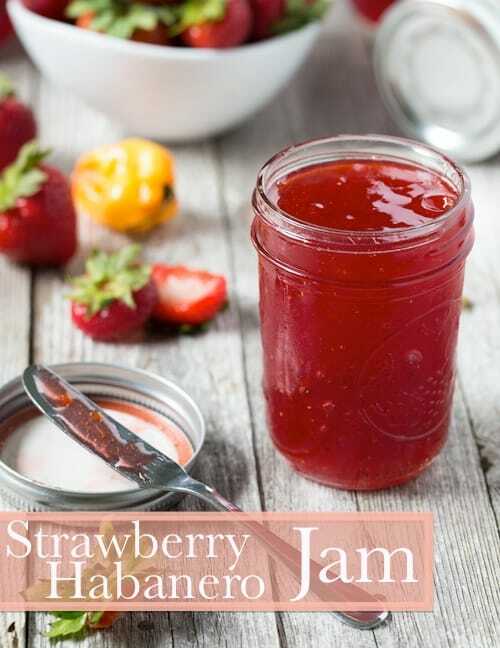 My family and I just pick 27lbs of strawberries for me to make jam and on the way home the idea to make strawberry habanero jam came to mind. We use to get some very yummy jam at a farmer’s market in Olympia, WA when we were stationed there and they loved habanero jams on my biscuits and gravy. 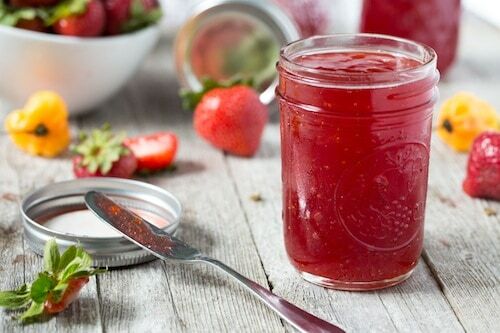 My question for you is in all the years I have been making jam I have only ever used powder pectin, so would this recipe work with that instead of the liquid? Hmmm, honestly, I’m not too sure. I remember having the same question awhile ago when I was first making this jam. I’m not really a jam-making expert so I would suggest doing a quick google search or something like that. Maybe there is a conversion for liquid to powder that you can follow. Let me know how it goes!